Many paranormal investigators, if not all, focus much of their investigation time on either looking for EVP's or looking for unknown sources of energy spikes, or drains. During these investigations, the use of EMF meters are common and if they were to show a change in electromagetic activity, the investigators might tend to belief they have a spirit present. What if we told you that you might very well be in the presence of a natural occurrence or even a solar event, and not paranormal activity? Let's take a look at different things that could affect your investigation, especially if you're in an active GIC (Geomagnetically Induced Currents) zone. The photo at left shows a basic example of areas in the North America region of the globe and how the thickness of the earth's crust, the layout of the major power grid lines, and the solar winds could affect the power grid, and even your EMF meter. To learn more and to really dive into this piece of education, you'll want to visit the GIC portion of the USGS website. To really bring it closer to home for your investigations, you can check the real time GeoMagnetic Conditions page before, during or after your investigation to compare your EMF spikes with observed and documented natural geomagnetic events. Once you have a handle on that, to really dig deeper and understand how the areas of the United States can be affected by natural and man made geomagnetic interference, you should check out the Regional Conductivity Map and learn about how it might apply to your investigations. 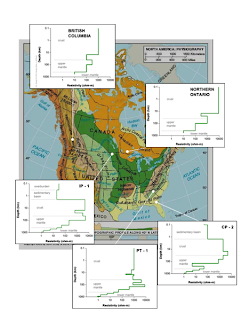 The United States Geological Survey (USGS) offers some great online education, free, to get you and your team up to speed. It really is worth the investment of time if you consider yourself a true researcher in this field, and not just a thrill seeker. There are also many other forms of electromagnetic fields that can interfere, or trick you, during an investigation. To learn more you can check out this link, or this one about the HAARP program, or this really good one here.